Blessed with a deadly accurate boot and impressive composure for one so young, Patrick Lambie is a fly-half of enormous potential who plays for the Sharks and South Africa. 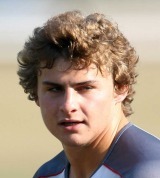 Lambie was capped by South Africa at schoolboy level before starring for their under-20 side. He broke into the Sharks' Super 14 side during the 2010 season, making his debut from fullback. During the Natal Sharks' Currie Cup campaign he was shifted into centre and then fly-half as his influence on the side grew. He soon became an integral part of the side and helped them to Currie Cup final victory over Western Province. His flawless form at fly-half earned him a place on South Africa's end-of-season tour of the Britain and Ireland. Lambie made his debut against Ireland, coming on as a replacement for fly-half Morne Steyn midway through the second half. He scored his first international points moments later, converting a try by Gio Aplon. Lambie went on to feature as a replacement in the subsquent tour games against Wales, Scotland and England before eventually being handed his first start for his country against the All Blacks - at fullback - in the 2011 Tri-Nations. His first start for the Springboks had come after another hugely impressive Super Rugby campaign in which he broke the record for the most points scored by a Sharks player in one season.